‘Fruit rather small, of a globular-ovate figure, abruptly tapering from the middle, both to the crown and the stalk, about two inches and three quarters deep, and the same in diameter. Eye small, open, with a short, slender, strigose calyx, placed in a rather narrow and shallow basin. Stalk one inch and a half long, slightly inserted by the side of a small elongated lip. Skin pale yellow, mixed with green, and tinged on the sunny side with a lively orange-brown, interspersed with numerous minute russetty spots. Flesh yellowish white, a little gritty, but tender and mellow. Juice sugary, with a slight perfume. Ripe the end of September, and will keep two or three weeks.’ [George Lindley – Orchard Guide p.361/1831]. ‘This is a Scotch variety, and partakes something of the Swan's Egg. It is a desirable and hardy fruit.’ [George Lindley – Orchard Guide p.361/1831]. I have no information on its date of introduction. It is probably the pear figured in Pomona Austriaca as ‘Die Schwanneneybirn’ or ‘Poir d’Oeuf de Cigne’ [Pomona Austriaca t.128/1792], the illustration used here. 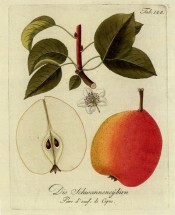 Listed in the 1850 and 1857 catalogues [Pear no.25/1850]. There is no diary entry for this pear.